This study was conducted by GRIID intern Chloe Beighley and Jeff Smith. Product Placement in films is nothing new and has been part of Hollywood films since the early days. However, contractual agreements became formalized in the 1980s, with the film ET, when director Steven Spielberg got the Reeses Company to sign a contract to pay the film company money to use Reeses pieces in one scene. Ever since, product placement has not only been contractual, it has escalated to a degree that there might be 30 – 40 different contractual products that appear in any given film. In addition, we have seen the use of branded products go from backdrop props to integral parts of a movie script. This is a trend that is investigated in the 2000 documentary, Behind the Screens: Hollywood Goes Hypercommercial. 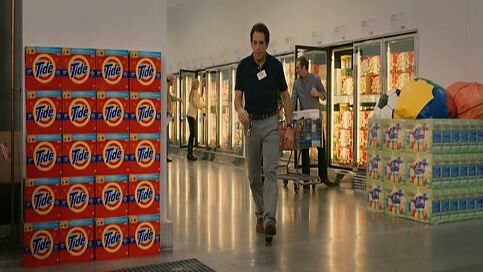 GRIID has investigated Product Placement in films in both a 2002 film study and more recently in 2011. 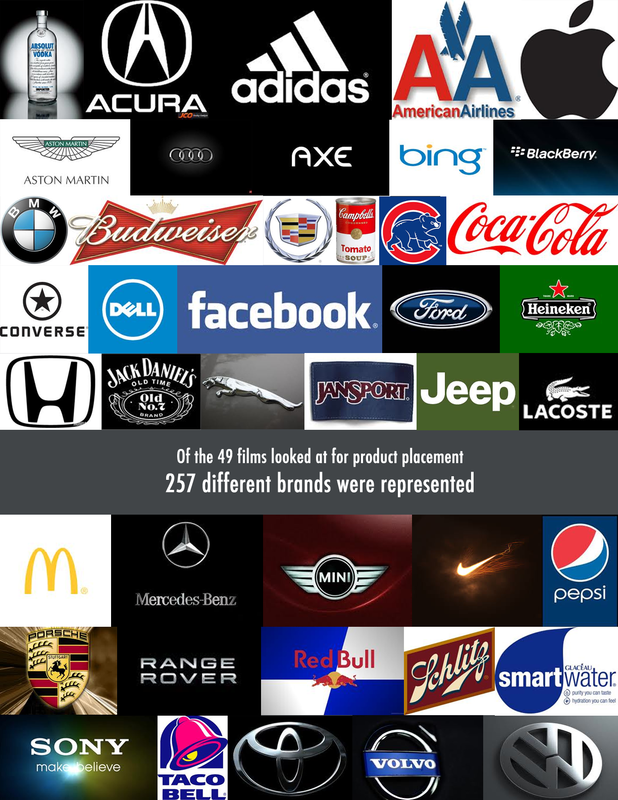 In this year’s study there were numerous examples of product placement, both in terms of frequency of use and products that were central to the film’s theme or main characters. We looked at 49 of films from 2012 for this study and identified those, which had products as props, and those where products are more prominent. Below is a table detailing the brands that were scene in the films, and the film(s) in which they were featured. Following the table, we provide some content analysis of products that appeared in films and those which were woven into the script. There is a varying degree of integration of these products into films. In some of the films, the product was written into the script, and is a prominent part of the film. On the other side, in some of the films, the product is used merely as a prop or a means to an end. Often times, the product placement that is seen in films does not affect the overall film. One prime example of that would be the film American Reunion, the final installment of the American Pie films. This movie featured quite a bit of product placement. Apple products are used twice, an apple iMac computer, and an iPhone. There are two different types of Ford cars seen, as well as a Mini Cooper. When the characters are at the beach, they are all wearing Ray-Ban sunglasses. When they are at the bar, they are drinking Budweiser products, and only Voli Vodka is seen behind the bar. Also, while most movies use fake websites, the dating site featured, jdate.com, is a real site. While those products were not integral to the film, they were all shown and used. The Amazing Spider Man offers the majority of its product placement via websites that are shown being used. The Microsoft search engine “Bing” is used three times by Peter Parker, and he clicks through on one of those occasions to the medical search engine “WebMD.com.” We also see accessories as product placement in this film, as three of the main characters are wearing different models of Oliver Stone glasses. Also, the characters use all Sony products. Again, these products were all used as a means to an end for the characters. Taken 2 offered quite a bit of product placement from Apple, namely the iPhone 5, as well as Mercedes. The iPhone placement is not surprising since the movie was released on October 5, 2012, and the iPhone 5 was released on September 21, 2012. Product placement is even seeping into films where it seems less likely, such as The Hunger Games. Despite the film takes place in a futuristic society, with the majority of it taking place in a forest-like setting, one product did manage to slide into the film. 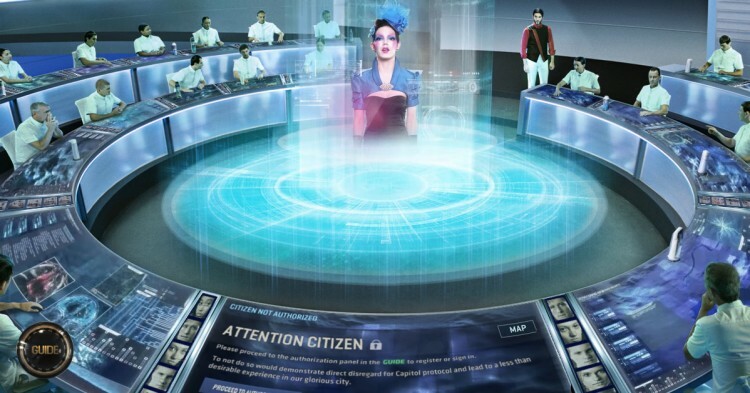 In a scene in the “Control Room,” there is an image of the futuristic looking 321 Water Bottle. Even though it was not a prominent part of the film, it was still used as a prop. Often times, one of the largest spots for product placement to be used as props is with vehicles. It is nearly impossible to feature a “name-brand” car, so big name automotive makers are featured in quite a few films. In 2012, 33 different types of cars, trucks, and motorcycle were used as transportation by main characters or as props. It is not surprising that these cars and trucks were used for brief periods of time in the films we included in the study, but the vehicles often appear at key moments in the plot. 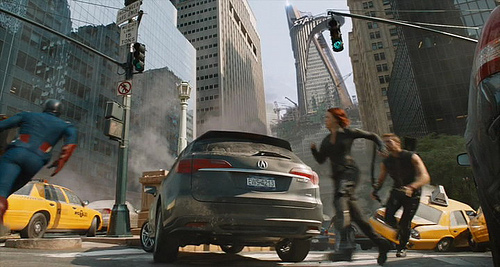 For example, in The Avengers, in the middle of the large fighting scene, there is a clear shot of a new Acura SUV that was cross-promoted with the film while the film was being advertised at the box office. Towards the end of the film, there is another image of a new Acura sports vehicle. Similarly, in American Reunion, the men are standing in a parking lot talking at one point, and happen to be standing around a Chevy truck. This type of placement for the sake of placement is something that we see quite frequently with snack foods and drinks. Coca-Cola is seen in 8 of the 49 films, but is not necessarily intrinsic to any of those plots. Similar, we see many different types of cereals, potato chips, water bottles and snack products in general as was documented in the product table previously. In Silver Lining Playbook, the product placement is very subtle. There are mentions of Raisin Bran cereal, Bud, and Bud Light. However, the most notable brand is Hellmann’s Mayonnaise jar. The book that the movie is adapted from states that the lead character has a mayonnaise jar that he keeps water in, and drinks out of obsessively. However, they do not name the brand in the book. In the movie, it was given a name and a label and seen in the mental hospital, the family kitchen and the dance studio where the characters practiced. There was also some speculation as to whether the major pharmaceutical companies had bought into the movie as well, since the names of a variety of medications were mentioned. They did not have a contract with the movie, and the names were added for dramatic effect. Both That’s My Boy and Flight feature many scenes where the lead characters are drinking Budweiser products. In That’s My Boy, it was more than a prop since Adam Sandler’s character was seen drinking it in nearly every scene. In Flight, the drink was used as a vice and the downfall of Denzel Washington’s character. However, That’s My Boy portrays the main character as having an addictive personality, much like the main character in Flight, but again, Bud products are seen in nearly every scene of the movie. Budweiser products were featured in 11 of the films we included in our 2012 study that contained product placement. The theme among the films was very similar, all featuring white, male, lead characters, which are doing some kind of work and are drinking Bud products in “fun” situations or to relieve stress. It was not necessarily more than a prop in these films, however we see the added dimension of Budweiser targeting teenagers and men in these films. The Dark Knight Rises offered one, very large, product placement of Pittsburgh Steelers player Hines Ward. Though the jerseys and field were not 100% Steelers, there was certainly the illusion that was the team playing. Also, pre-movie product endorsements, included the Mountain Dew exclusive trailer, and website, which allowed viewers to interact in Gotham city, as well as a Nokia Lumina App which offered exclusive Dark Knight games, wallpapers, and ring-tones, only available on that phone. The Five-Year Engagement was certainly a large promotion for the Michigan city of Ann Arbor. The majority of the movie takes place there where one of the main characters works at The University of Michigan, and the other works at a famous local bakery and sandwich shop, Zingermans. Universities are frequently written into scripts as parts of the plot, like in The Five-Year Engagement and also in The Perks of Being A Wallflower, where Penn State University was featured. Using specific universities helps to add an air of realness to the films, and enables the viewer to connect with the characters on a deeper level. This technique is also something we see in the use of restaurants in films. In The Perks of Being a Wallflower, the popular restaurant Olive Garden is featured. In Magic Mike, the characters frequently reference eating at a Waffle House. These are restaurants that the majority of viewers will be familiar with, thus normalizing them as commercial places to eat for the general public. One brand that was largely featured was Apple. The products that were used were iPhones, Macbooks, iPads, and their larger desktop computer. Apple products were seen in 12 of the top films of 2012 that featured products. They were not necessarily more than a prop in some of the films, however, one difference in the placement of Apple products is that they are seen being used by a younger demographic in a majority of these films. They are targeting a younger audience who may use the products for entertainment or educational purposes. Furthermore, in the film That’s My Boy, an application created for Apple products, “Angry Birds” is featured. In the movie The Dictator, a character becomes an employee of the Apple Store, one of their “Genius” workers. The scene from the movie makes a commentary on the Apple products and Americans. When the main character Aladeen met Nadal in a restaurant, he asked him to help him get back into power as the dictator of his small country. One last film where the product is more than a prop is the film The Watch, where one of the main characters played by Ben Stiller is the manager of a Costco. There are many scenes in The Watch that take place inside Costco (displaying even more branded products) and outside of Costco, where the name on the building in is prominently displayed. 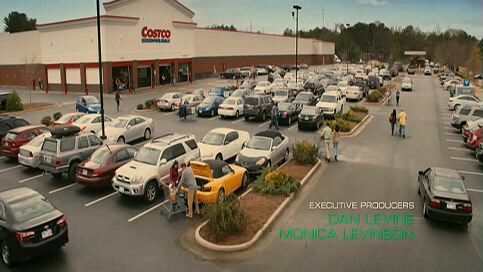 In addition, the scenes taking place in and around the Costco store, Costco is mentioned dozens of time in several different dialogues in the film, since not only does Ben Stiller’s character management the store, but the store is the part of a murder scene and is the location of the big finale, where the neighborhood watch takes on aliens from outer space. Product Placement is so much a part of the Hollywood movie experience that people might not even notice it. Even if audiences do recognize product placement, they might react with a certain level of indifference, since the branded products we see are often part of our lives. However, it is important to not only recognize that in all forms of media, including film, there is an increasing level of hyper-commercialism. This hyper-commercialism is deliberate and is part of corporate campaigns to brand their identities with the public, despite the fact that they add no real artistic value to movies.